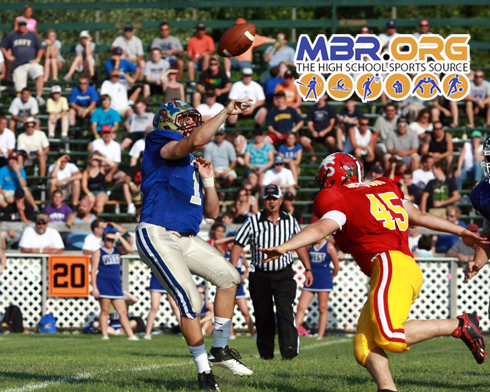 It took a while for the action to heat up in the 22nd Maine Shrine Lobster Bowl Classic. For much of the game the players (and cheerleaders) had to battle the high temperatures just as much as the players on the opposing sideline. Whatever action that lacked to start the game, however was made up for at the end, when the lead and momentum swung back and forth. Just when the East took the lead late in the fourth quarter, the star that shined brightest, Portland's Imadhi Zagon took the kickoff 85 yards to the house for the winning touchdown. After the West went three-and-out on the opening possession, the East opened the scoring on their first possession. Bangor QB Joe Seccareccia quickly moved the East offense down the field. As the East closed in on the red zone, the West defense toughened up, stopping Edward Little's Teven Colon short of the 1st down marker on 3rd and short. The East was then called for a false start, making it 4th and 6. Coach Mike Hathaway's team had no choice but to go for it, as they were too close to punt, and out of field goal range. Seccareccia then showed why he is one of the top QBs in the state, lofting a fade pass right into the arms of Belfast's Lani Eversage for a 29 yard touchdown catch. The PAT gave the East an early 7-0 lead. Neither team could do much for the rest of the quarter, as the heat and the wind were making it tough to get any consistency on drives. The East drove down the field again to end the first quarter inside the red zone. The East was again faced with a 4th down attempt with a chance to score. This time the West defense was up for the challenge, knocking Seccareccia down for a loss to turn the ball over on downs. The West offenses started to show some signs of life on the next possession, as Thornton QB Josh Woodward and Deering WR John Hardy played pitch and catch. The drive stalled in the middle of the field as Hardy couldn't get his hands on a pass on 3rd and long. Cheverus standout and Fitzpatrick Trophy winner Peter Gwilym then made one of the unsung plays of the game, booming a 51 yard punt deep into East territory. After Colon was stopped for no gain on 1st down, the West got a big break on the very next play, as the snap went over Cony QB Luke Duncklee's head and though the end zone for a safety. That made it 7-2 East, and more importantly gave the West the momentum and the ball back. A solid kick return by Hardy put the West at midfield to start the drive, and two quick passes from Deering's Jamie Ross to Kennebunk's Ethan Drigotas put the ball at the East 33 yard line. After an incomplete pass and a stuffed QB keep by Ross, the West found themselves in a crucial 4th and short situation. Zagon then went to work, taking a sweep to the right side, made one defender miss, and was off to the races for a 27 yard touchdown run. The West took a 9-2 lead, their first of the game, with 5:02 left in the first half. After the East went 3 and out on the next series, the teams traded turnovers. First the East recovered a fumble as the West was driving down the middle of the field. Four plays later a Seccareccia pass landed in the arms of Gwilym. Ross tried driving down the field while also running out the clock, but failed in both attempts. The West was forced to punt with 12 seconds left. However, in desperation on the very next play, Seccareccia's heave into the end zone again found Gwilym's hands, this time to end the half. The West took a slim 9-7 lead into halftime, as both teams needed a break, from both the play on the field, as well as the heat and humidity. The teams traded 3 and outs to open the second half. On the East's second drive of the half, the West again picked the pocket of Seccareccia, this time by Sanford's Shawn Goodrich. All that led to was another stalled drive by the West offense. The East drove down the field on their next possession, this time with Duncklee under center. Duncklee completed his first two passes, then scampered for 20 yards on his own, to give the East a 1st and goal at the 9 yard line. Duncklee was again the beneficiary of a bad snap at the wrong time, as the ball sailed over his head to the 31 yard line. The East couldn't get any closer, and Westbrook's Trevor Bates and Mountain Valley's Christian Durland combined for a sack of Duncklee on 4th and forever. The two teams traded stalled drives, and the West got the ball with time winding down in the 3rd quarter. As the teams switched sides for the fourth quarter, the West drive was stuck at midfield. The East got the ball back, and also got some extra help from the sun, as their sideline was now shaded. That seemed to energize the East, as Duncklee took over at quarterback with the game getting down to desperation time. The Cony graduate worked his way down field, completing 3 long passes, and running for a 1st down to put the East the 14 yard line. Duncklee then let Colon finish off the drive, running the ball 3 straight times, with the last one going 3 yards for the go-ahead touchdown. Coach Hathaway chose to go for the 2-point conversion to make it a 6 point game. The first attempt fell incomplete, no thanks to an obvious pass interference call. On the second attempt the East tried to run it, and where stuffed short of the goal line, keeping it a 13-9 game. Zagon then jogged onto the field and took his position deep in his own territory to await the kickoff. What happened next stole the show. The bruising former Bulldog running back took the ball at the 15 yard line and made his way up the field. At least 3 times he should have been brought down, but he used his strength to fight through tackles, and eventually found a crease, and zoomed up the right sideline away from the rest of the pack, reversing momentum before the East could even blink. With the extra point it was 16-13 West with under 5 minutes to go. The East tried mightily to fight back, but both Duncklee and Seccareccia were intercepted by Alex Rose of Livermore Falls, which wrapped up the game and the win for the West. It was the West's first win since 2008, and only their 2nd win since 2005. The win upped the West's all-time record in the series to 16-6. Colon was named MVP for the East, running for 55 yards and a touchdown. Zagon was named the MVP for the West, scoring both touchdowns, running for 62 yards, and of course, the game-changing 85 yard kick return. For many of the players, it was their last time playing organized football. For the players who will continue their careers in college, it will be a lasting memory, win or lose.